Contractor continued trenching for fiberglass conduits west of the intersection of 8th Street, NE and Monroe ST NE. Contractor continued trenching for fiberglass conduits form the west vault manhole towards the split. At East side, Intersection of 9th ST and Monroe, the contractor continued excavation for 12 –way fiberglass conduits from the Vault MH to the split. Contractor continued trenching for fiberglass conduits form the west vault manhole towards the split; and laid and encased fiberglass. Contractor encased the 12-way up to the split at the West side. At East side, Contractor poured concrete to encase 5”, 12-way fiberglass conduits. Contractor backfilled trench cut for 12-way 5” Fiberglass conduits at the intersection of 8th Street, NE and Monroe Street, NE. placed GAB and Geotextile fabric. Tie bars were drilled and bottom rebar placed. 10” PCC poured for roadway base restoration. Due to construction, there is no parking on Monroe Street from 7th – 8th Street NE for the period of 8/14/17 – 11/11/17. NO PARKING signs have been posted. Contractor continued trenching for fiberglass conduits at the intersection of Monroe ST NE and 9th Street. 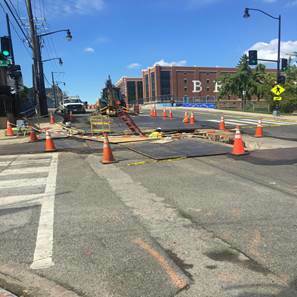 Contractor continued placement of Pepco fiberglass conduits at the intersection of Monroe ST NE and 9th Street. Contractor started the excavation on the West side to connect the West Pepco Vault manhole with the existing Vault manhole in the Bozzuto property west of 8th Street. Contractor continued trenching for fiberglass conduits West of the intersection of 8thStreet, NE and Monroe ST NE. Contractor continued to excavate for the 2-way PVC at the intersection of 9th ST and Monroe ST NE. Contractor continued trenching for fiberglass conduits at the intersection of Monroe Street NE and 9th Street NE. Because of underground utilities, work is being done by hand to go below water/sewer line present. Another unidentified pipe was found on 9th Street by the west curb. DC Water was called to identify the line. DC Water to come on Tuesday 9/5/2017. The MOT set up worked accordingly and each end had a flagger to direct traffic. It started to rain at 11:30 AM. 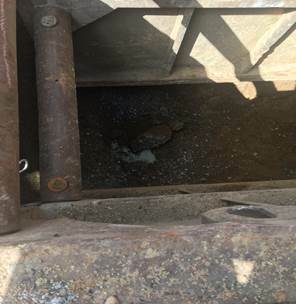 Contractor covered opened trenches with steel plates and suspended work around 12:30 PM. Contractor continued trenching for fiberglass conduits at the intersection of Monroe Street NE and 9th Street NE and also west of the intersection of 8th Street NE and Monroe Street NE. Contractor used two crews (one at each end of the bridge). In addition to the civil crew, contractor had (1) electrical crew on 9th Street NE to continue excavation. Contractor continued trenching for fiberglass conduits at the intersection of Monroe Street NE and 9th Street NE and also west of the intersection of 8th Street NE and Monroe Street NE. Contractor used two crews (one at each end of the bridge). The electrical crew is working on 9th Street NE to continue excavation. Contractor continued trenching for fiberglass conduits at the intersection of Monroe Street NE and 9th Street NE and also west of the intersection of 8th Street NE and Monroe Street NE. Due to construction, there is no parking on Monroe Street from 7th – 8th Street NE for the period of 8/14/17 – 11/11/17. NO PARKING signs have been posted. 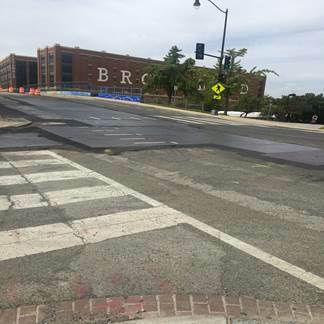 Contractor worked on riser forming work for the Vault manhole west of the intersection of Monroe Street and 8th Street NE. Contractor continued trenching for fiberglass conduits to connect the east Pepco Vault at the intersection of Monroe Street and 9th Street NE. No construction activities due to rain. Contractor continued trenching for fiberglass conduits at the intersection of Monroe Street NE and 9th Street NE. Because of underground utilities, work is being done by hand to go below water/sewer line present. 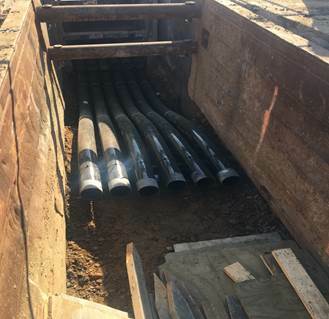 Contractor FMCC continued trenching for fiberglass conduits at the east side of the bridge – Conduit will go from Pepco vault in 901 Monroe property to the newly placed manhole at the intersection of Monroe and 9th Street NE. Contractor FMCC continued trenching for fiberglass conduits at the east side of the bridge – to go under existing utilities, contractor is hand digging.